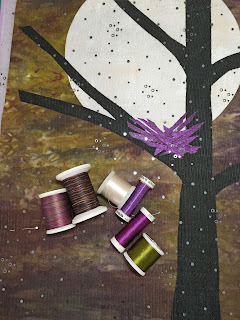 In some of my previous blogs, I've mentioned sheer fabrics and how they've been added to the nest quilts that are part of my mixed media art quilts. Some of them have one or two layers of organza to create depth and blur the background. 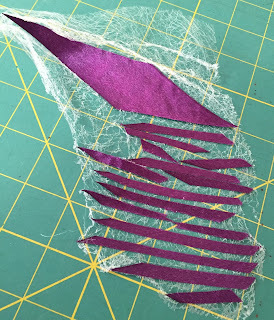 Some have organza or tulle used as a sandwich to trap the mixed media fibers of the nests. Some have tulle to add darker or lighter features. This art quilt has a different kind of tulle and some other cool fabrics. A fancy tulle fabric with silver sequins jumped out at me as I was looking for inspiration for a nighttime quilt at JoAnn's Fabric. I think that fabric speaks to us. You know how that is - you touch it and stroke it and all kinds of ideas of how to use it jump into your head. Or it's a color that you love, a texture that appeals to you, and its on sale! You just have to own it! So this fancy tulle came home with me. I already had the background fabric for this nest quilt, which was made by Judy Robertson who creates the loveliest hand dyed fabrics. I usually have to own one of her pieces for years before I have the nerve to cut into it. This piece was up on my design wall for a month while I was thinking about another nest quilt. After a visit by my daughter in law and granddaughters, where they gave me some suggestions, I was off and running. 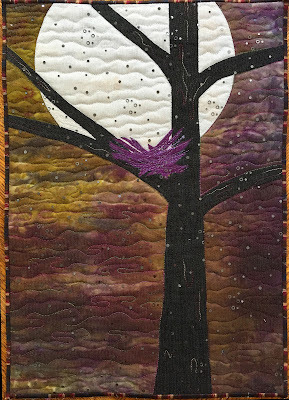 I picked up a fabulous grunge fabric made by Moda Fabrics at Fiddlesticks Quilt Shop that I used for the moon. I like the mottled look a lot. There were 6 different colors of thread used for the quilting. I change threads both in the top and bottom a lot when quilting an art quilt! The nest was made with purple ribbon that was fused down with misty fuse. My first try with this technique gave me mixed results, so I'll have to fine tune that process! Let me just say that sticky fingers make it hard to place tiny strips of fabric onto the background. I hope you like the quilt! That sequined tulle provided the right amount of sparkle and how wonderful to have such a productive consult from your daughter in law and your granddaughters! !